In early spring when a light frost is still possible, or in early autumn. This compact nativar functions perfectly in natural and formal settings; great for a front border in perennial beds or in groupings. Wet soils will not be tolerated. Cut back to the ground in autumn. Can be divided in early spring. Deadhead to promote continued bloom. Watering Details: 1" per week is plenty. Can go longer once established. Soil pH: Prefers slightly acidic conditions. Fertilizer: If soil is especially poor, mix in about 2" of compost before planting, and top dress with an additional inch each spring. An all-purpose, organic granular or liquid fertilizer is also adequate. Plant: Sturdy, branching plants with a cluster of dark green basal lance-shaped leaves. Flowering: Frilly 2-3" wide lavender-blue terminal flowers. Seeds: Flowers turn into nutlets, brown in color and surrounded by papery bracts. May self sow. 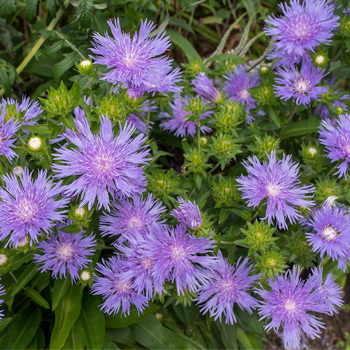 The genus name Stokesia is in honor of Jonathan Stokes, an English botanist and physician (1755-1831).